Back in December, several fashion designers said, unprompted, that they would not dress incoming First Lady Melania Trump. Stefano Gabbana wasn't one of them, and when Mrs. Trump wore a Dolce & Gabanna coat in her official portrait, he put up an Instagram calling her "beautiful" and thanking her for wearing his clothing. #DGWoman BEAUTIFUL ????? #melaniatrump Thank you ??????? #madeinitaly???? Thanks to all those who appreciate our work ? 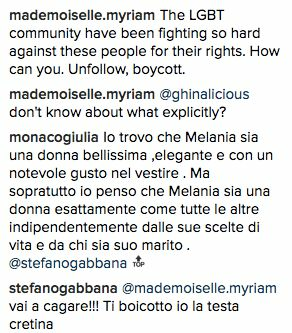 Gabbana has said nice things about the Trumps before, but now people are calling for a boycott of his clothes. And his response? "Vai a cagare"--"Go to hell" in Italian. Huffington Post was able to capture these screenshots of Gabanna telling off people in his Instagram comments. He also told a person that he did not care that she was unfollowing him. It's nice to know that at least one designer is willing to set politics aside and doesn't care who wears his clothes. Melania Trump is not her husband, and she looks darn good in that picture.